This three day tour will show you the highlights of Scotland, including an overnight stay in Skye. Discover the highlights of Scotland in just three days: Glen Coe, Culloden Moor and Loch Ness, plus you'll have a fabulous two night stay on the magical Isle of Skye. As we leave Edinburgh and Glasgow behind there's a song in our heart as we make our way along the banks of Loch Lomond. Our first stop will be in the pretty village of Luss, where we can admire the panorama over the loch to Ben Lomond. We cross the remote beauty of Rannoch Moor, an unspoilt landscape of more than 50 square miles before making a photo-stop in Scotland’s most famous glen, Glen Coe. You’ll be spellbound by the dramatic atmosphere of this very special place. There is a break in Fort William before enjoying wonderful views of mighty Ben Nevis, Britain's tallest mountain. We enter the Great Glen and travel along the banks of Lochs Lochy and Oich. As we drive through the small village of Invergarry look out for the "Well of the Seven Heads", a monument with a very bloody tale to tell! As we tour through scenic Glen Shiel look out for the vast "Five Sisters" range of mountains. If you are lucky you might spot one of the many eagles that call this part of Scotland home. Our drive along the banks of Loch Duich brings us to the picturesque Scottish icon of Eilean Donan Castle*. You'll have time to discover the castle for yourself during our time here. Next we make our way over the road bridge connecting the mainland to the island to Skye and make our way to our accommodation. Enjoy a relaxing breakfast then we set off to explore one of the highlights of Scotland - the Isle of Skye. After the attractive villages and gentle scenery of the southern part of the island, the views change dramatically as the Cuillin Hills, considered the finest in Britain, come into view. The picturesque town of Portree is Skye’s largest community and is set round its natural harbour. Portree means the "King's Port", following a visit by King James V in 1540. Our stop here lets you explore the old-fashioned appeal of the harbour with its painted houses and browse the interesting shops which embrace Sumerled Square. Our excursion continues to the famous Trotternish Peninsula. From Portree we travel northwards to the little port of Uig, from where ferries sail to the Outer Hebrides. There is a monument at Kilmuir to Flora MacDonald who assisted Bonnie Prince Charlie escape from the troops hunting him by helping him "over the sea to Skye" disguised as her maid. We stop to explore The Quiraing, a dramatic terrain formed by a massive landslide dating from Jurassic times. As you walk through the landscape, see if you can identify the rock formations described as the "Needle", "Table" and "Prison". A short drive brings us to Kilt Rock, named after the way the basalt columns of the rock resemble the pleats of a kilt. A great backdrop for a truly Scottish photo opportunity! In the islands of the Hebrides Praban na Linne - The Gaelic Whiskies are an institution. Located on the beautiful Sleat peninsula, known as the Garden of Skye, they are produced in the traditional way and have a unique taste. After a busy day of sightseeing you might want to end the day enjoying a wee dram! Please note that the order in which today’s tour operates may vary. This morning we bid farewell to Skye and retrace our steps to the mainland then tour through Highland scenery to reach mysterious Loch Ness. Here you can enjoy a loch cruise * to experience wonderful views of Urquhart Castle. The castle overlooks the deepest part of Loch Ness, so is a popular place with monster spotters. From Inverness we make our way to Culloden Moor* which is our next stop. It was here in 1746 that Bonnie Prince Charlie's dreams of capturing the Crown for the Stuart dynasty came to a bloody end and changed life in the Highlands forever. We travel into the Spey Valley which boasts the majestic Cairngorm Mountains as a backdrop. Later we make our descent of the Drumochter Pass, which has linked the Highlands to the Lowlands since the earliest of times. Pitlochry sits on the banks of the River Tummel and is the geographical heart of Scotland. This lovely town has been attracting visitors since the 19th Century and today it is ours to discover. Our journey continues to Perth where our tour separates. 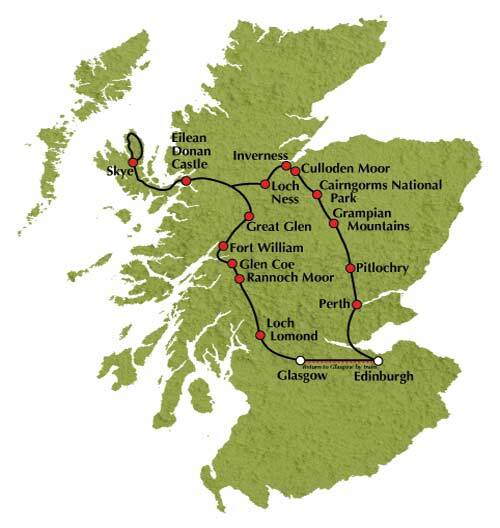 If you’re returning to Edinburgh the tour will continue through the ancient Kingdom of Fife and over the Forth Road Bridge affording close-up views of the famous rail bridge and the new Queensferry Crossing. If Glasgow is your destination then you’ll make your way through Strathallan to Stirling where there are wonderful views of its proud castle to enjoy. Tour Highlights: Loch Lomond, Glen Coe, Fort William, Ben Nevis, Glen Shiel, Eilean Donan Castle, Five Sisters, Isle of Skye, Portree, Cuillin Hills, Inverness, Loch Ness, Culloden, Pitlochry and Perth. A child discount of £10 applies to children aged 3 to 15 years inclusive. We’re really sorry but children aged under 3 years cannot travel on this tour. Photo-ID may be requested to confirm discount entitlement.